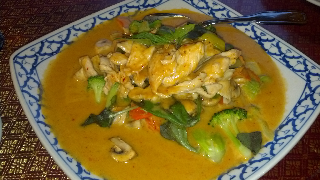 The little Thai house on River Road in Keizer has a new owner and a new look. I must say it's been in need of a little love and care. It is now called Sweet Home Thai Cuisine and has a fresh new sign out front. I was eager to see what had changed inside as well. The inside looks much the same although it's been spruced up some. There are a few pieces of Thai decor, but nothing stands out and it is all in subtle tones. The walls are a cheery yellow and they still have the same slightly uncomfortable, institutional green chairs from the former restaurant. I was greeted after a moment by a very sweet young lady who promptly made me forget all about the ugly green chairs. She was efficient and friendly as she ushered me to a seat, brought my water and offered me tea. She offered help with ordering and after finding out that the family had been part owners of a Thai restaurant in Newport for years, I asked what she thought their specialty was. I decided on the recommendation of Red Curry Noodles and then added the Fresh Spring Rolls as an appetizer. The spring rolls came out quickly and were very pretty. The peanut sauce that came with them was a what I think of as a sweet, satay style. More sweet and vinegary than peanuty, but quite tasty, even if it was a little sweet for my tastebuds. 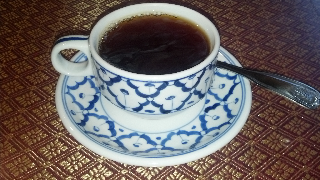 When I quickly ate the first little serving of sauce, the sweet angel of Thai food, my waitress, offered me more!! Now, if you know me, you'll know I love peanut sauce. Almost as much as I love my very favorite food, blueberries. So I was very happy about the extra sauce! And I didn't even have to ask. Ok. Back on track. The rolls were quite good, filled with fresh veggies, tofu, and herbs. Yum! The curry noodles came out pretty quickly after the appetizer and it looked amazing. The curry sauce was a rich and creamy. The vegetables were cooked just right and the noodles, though a little sticky at first, were soon covered by the sauce and I slurped them down with no problem. Throughout my meal, the waitress refilled both my water and tea several times without being asked. Granted, it wasn't particularly busy as I was there for an early dinner, but other patrons did float through as I was there and the one waitress on duty seemed to keep up well with everyone. All in all, my meal came to $15.50 with hot tea, appetizer and entrée. I would definitely return to Sweet Home Thai. I had excellent service, good food, and a quiet atmosphere. My wife and I just tried Sweet Home also and found everything to be outstanding. 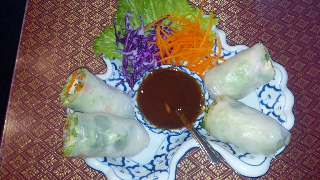 Next time (which will be soon) we will try the spring rolls for an appetizer. 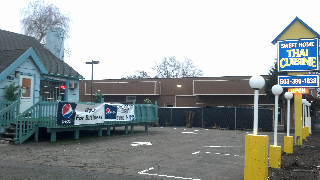 Best food and service we have had in Salem/Keizer in 8 years. Highly recommended. Likely the best Thai in town. On top of that, more generous portions than Thai Lotus. Take out was fast on one night. Other night, service was slow for eating in. Very nice people working here.